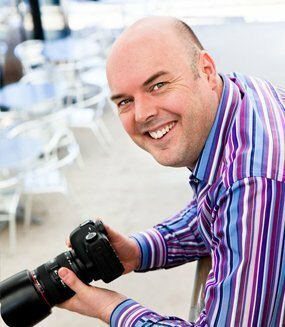 Many of my clients hate (or at least have a strong dislike of), having their photograph taken….is that normal? I’m not sure, but I know it’s true for a majority of my clients. I have had people arrive at the studio and burst into tears on arrival…(I hope) nothing to do with me…but just that their fear/dislike of being photographed is so strong. Fortunately, virtually every single client of mine leaves feeling that the process was nowhere near as awful as they thought it was going to be and most of them leave with a huge smile knowing that the photographs that have been created looked pretty good on the back of the camera. There’s a joke popular amongst photographers about how people perceive that the quality of camera has a massive influence on the photograph. It goes along the lines of “imagine being invited to Jamie Oliver’s house for dinner and saying on the way out; ‘Jamie that was a lovely meal. You must have a fantastic frying pan’”. Of course, the quality of a camera does have an effect on the quality of a photograph…but I always liken creating a portrait of someone to baking a cake (apologies, another, but unrelated, cooking analogy!). Baking a good cake requires just enough of the right ingredients, and there are lots of ingredients to a portrait. The camera and the photographer are the obvious ones, but it’s also about environment that the photograph is taken in, the light used, the posing of the person being photographed, the position of the photographer (and the light), and possibly the most important of all, the person being photographed and how they feel. I’m not going to bore you with all the detail, but how the photographer makes the person being photographed feel is critical to the results. Lots of my clients complain that they aren’t photogenic…I honestly believe that they just hadn’t been photographed by the right person up until that point. If you would really love to have a gorgeous portrait of yourself but don’t like having your photo taken or just don’t believe that such a thing could exist, you might just have found the right photographer. So you owe it to yourself to get in touch now…there’ll be no pressure, lets just have a chat on the phone. If you’ve read this far, thank you, and I guess you really do want to know about me. ….I’m a father of two beautiful girls and am very happily married to my wife and best friend Katie. Born and brought up in Warwickshire, I left the county after my A levels and spent many happy years away, all over the UK and latterly in Yorkshire for 20 years. My siblings starting their own families was just the draw we needed to bring us back ‘home’ to Warwickshire in 2010. I’m blessed to be doing a ‘job’ that I truly love. Since we returned to Warwickshire, I have rediscovered my love of cycling and like to take part in as many sportives as I can over the summer. I was a member of the Breast Cancer Care team for Ride London-Surrey 100 in 2015 and I rode Ride London again in 2016 for the Alzheimers Society after losing my dad in late 2015. In 2018 I rode London to Paris and my challenge for 2019 is my hardest yet; cycling the 150 mile Coast to Coast route starting at Seascale through the Lake District and the Yorkshire Dales and Moors to Whitby in a day (did I mention I’m a little bit crazy).